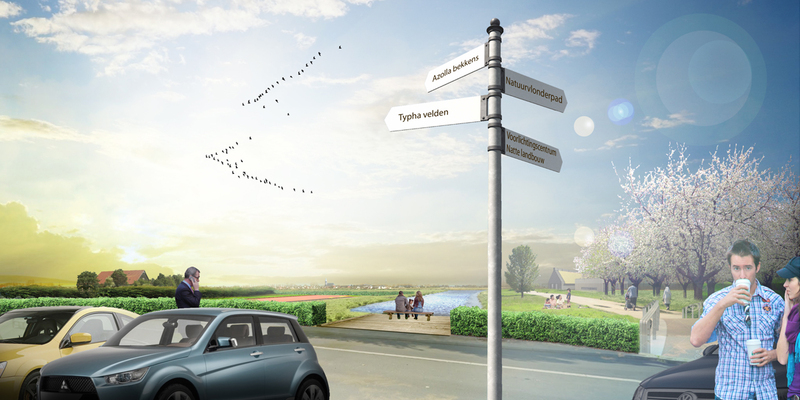 With an innovative and integral plan for the revitalization of overexploited dry riverlandscapes in the province of Gelderland, we have been selected for the third prize of the competition “Make Gelderland more beautiful”. The plan transforms expired farms in overexploited dry riverlandscapes into vital ‘water farms’. They focus on wet agriculture, but also on water storage, water treatment, biodiversity and recreation. 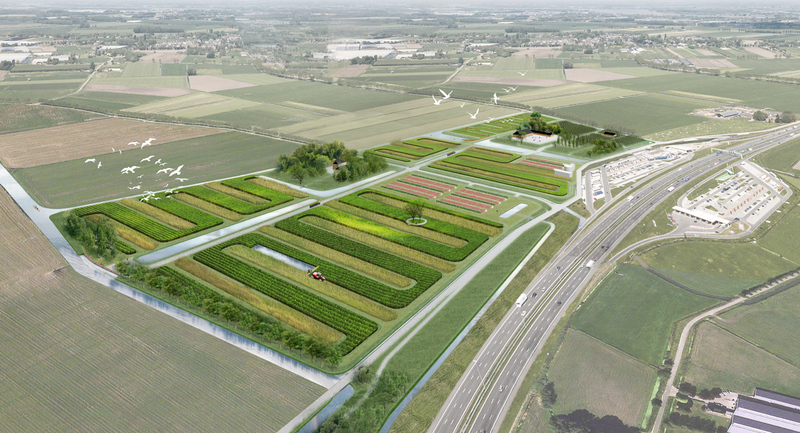 As a beautiful integrated design, this water farm will form an icon for the province of Gelderland and the Dutch Delta. 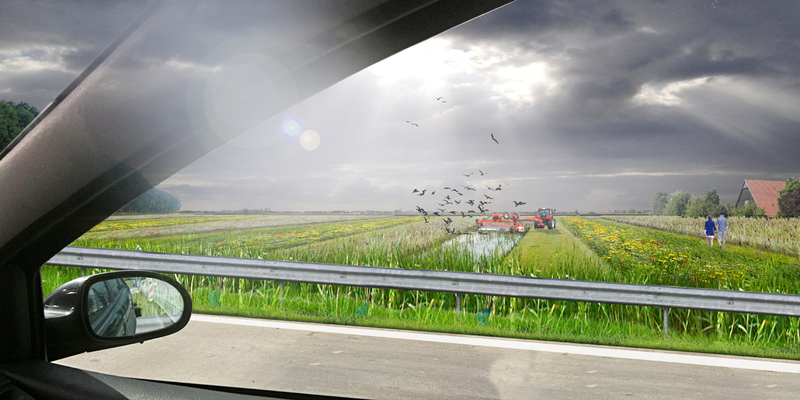 Our concept WATERBOEREN (water farmers), now designed as plan for a concrete proposed location near highway A2 in the Bommelerwaard area, is about transforming abandoned farms into vital farms focused on wet farming. ‘Water farms’ especially focus on bulrush cultivation, which has proven to be of high value as building material, animal feed or as a basis for bio-energy. But the plan goes far beyond the agricultural value. The wet crops are particularly resistant to water-level fluctuations, therefore the water farms also serve as water storage for nearby urban areas. By doing so it prevents flooding of lower parts of the area, but also saves water for dry periods. In addition, water farms serve as water treatment, of urban water and of effluent of local sewage systems. This not only fertilizes the crops, it also cleans water for the environment. 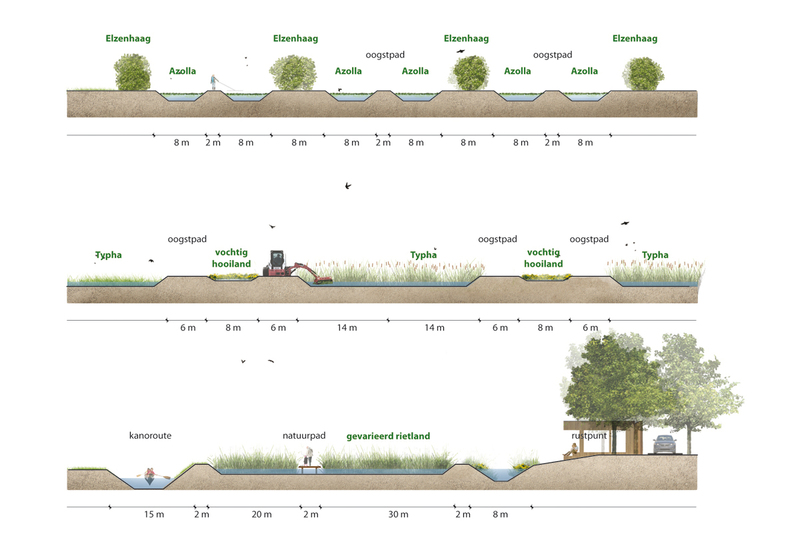 The project has been explicitly designed ‘nature-inclusive’ to enhance biodiversity, by deliberately allowing space for wet hayland, typical of the historically wet river landscapes. 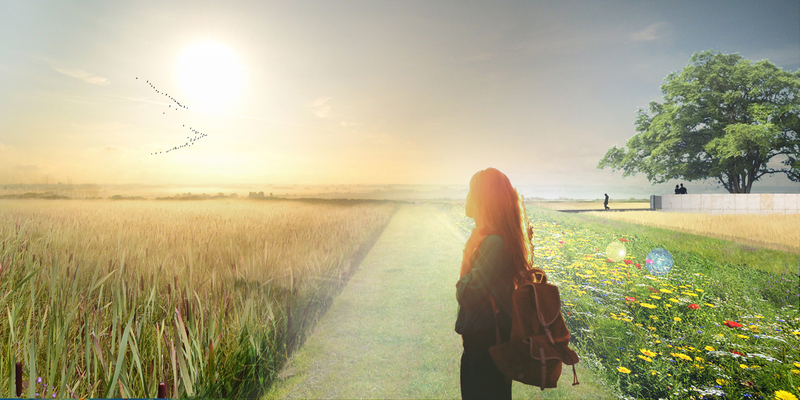 Finally, we have also given this project a recreational character, by creating views from the highway A2 over the water and the area, by adding hiking trails and boardwalks, a wetland information center and a canoe- and cycling hub.